There are two times of year that I talk a lot about total carbohydrate intake- Thanksgiving and the summer/ picnic season. Don’t get me wrong- I love a good macaroni or potato salad. 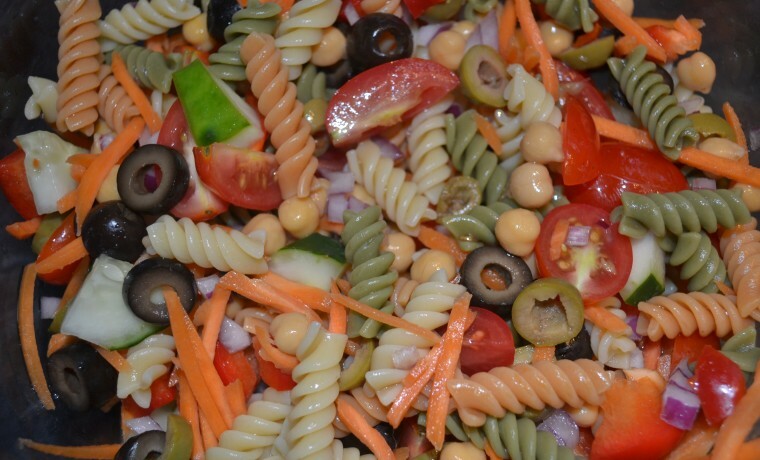 Here is the usual picnic/ barbecue line up: hot dogs (ON BUNS), hamburgers (ON BUNS), macaroni salad (pasta), potato salad (starchy vegetable), pasta salad (more pasta) and/or baked beans (starchy vegetable often loaded with added sugar). Whoa. This can make you exceed the daily Grain Food Group and daily total carbohydrate recommendations real fast. For most people, based on an 1,800- 2,000 calorie diet; one would only need 6 servings of grains in a day. (Please note: calorie needs depends on many factors). Not only that, but the mayonnaise on these types of salads and the sugar in the baked beans, make these high calorie side dishes. To start, let’s take a look at what our plate should look like. According to MY Plate a quarter of your plate should be protein, fruit, vegetable and grain. Or another good rule of thumb is to make half your plate non starchy vegetables. So in a world of mayo drenched summer salads, how do we get our veggies? If you are going to a party this summer, you may have to bring your own vegetables (BYOV). Here are some options: fruit and vegetable platters and trays, tossed salad (with mixed greens and vegetables) or bean and vegetable based salads mixed with oil based vinaigrettes or citrus juices. 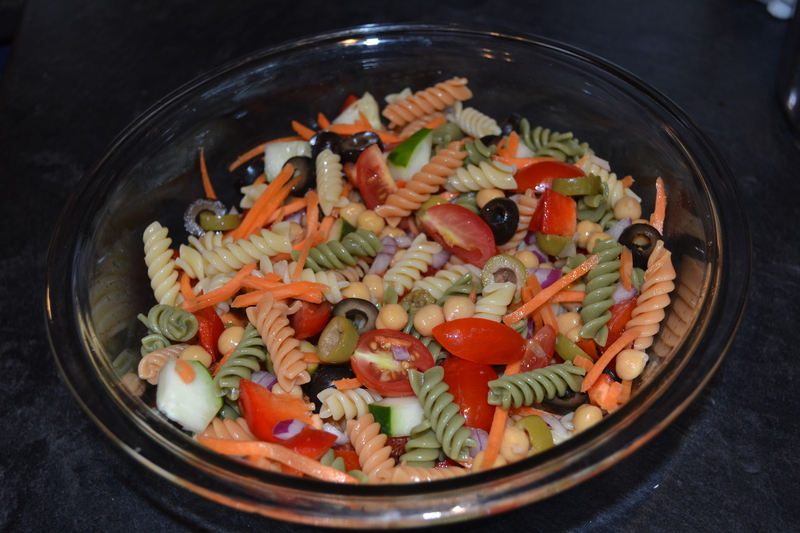 I love pasta salad. I would share my recipe with you, but I don’t have one. Here is how I do it. First, I use whole wheat pasta (about half of what most recipes would call for). Then I add vegetables and lots of them (broccoli, carrots, tomatoes, celery and peppers). Remember these non starchy vegetables are low in calories and high in fiber. They will help you feel full. Maybe add some olives (monounsaturated fat). Definitely add some beans. I usually use chickpeas. Once in a while I add low fat cheddar cheese or maybe even some pepperoni, if I’m feeling crazy. I leave the dressing off the salad, which allows guests to add as much or as little as they would like. Also, this way it does not soak into the pasta adding extra calories. Beans are a great way to add fiber and protein to a salad. I am lover of beans. Beans are a very underutilized food. Throughout my practice I have determined that most people don’t think they like beans, but in reality just have never used them (because they don’t know how). Give beans a chance. Memorial Day is around the corner. Check out the recipe below and try a different salad this summer. TIP: Rinsing and draining your canned beans reduces the sodium by 40%. 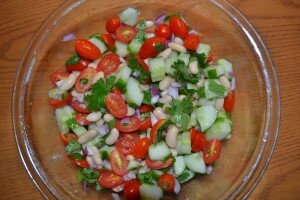 You can also substitute the cannellini beans with great northern beans.